Okay, here’s something you need to know. If you want to find me I’m usually doing my research and reading at the library near my home. I just love that physical feel of holding a book, smelling the pages etc. Or I hang around Kinokuniya (Borders at Wheelock Place, oh how i miss you so!). 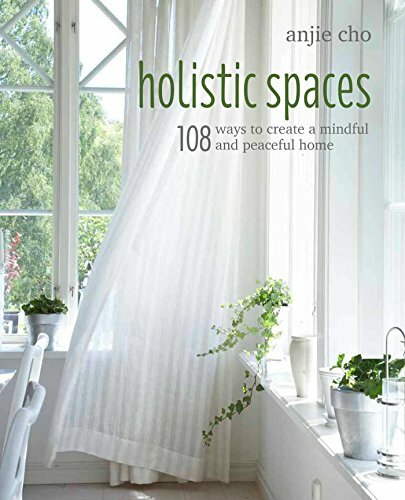 So at one time i actually chanced upon this book 108 Ways to Create Holistic Spaces: Feng Shui and Green Design for Healing and Organic Homes. Ok… not really familiar with Feng Shui (the only connection i have to Feng Shui is my amethyst bracelet – a gift from Mommy dearest who bought it from a Feng Shui expert). But green design, organic homes and healing just awakens all my mind antenna and these are topics that my curiosity thrives upon. The author of the book, Anjie Cho is the Founder of Holistic Spaces – integrating beauty, spirituality and green design. I like that in Anjie’s work, she creates balance in designing spaces with understanding of sustainability, practice of Feng Shui and creating spaces that is supportive and thriving for that individual. For me, i thought IKEA was my one stop and only place for all things i need in my room – and don’t get me wrong, i still do that but i just leveled up (haha!) the home decor game because not only i feel investing in a good furniture but having a piece that creates an inviting and a place that inspires me will always uplift my mood but more importantly i see myself thrive very differently. That simple tweak/s around our house so as to boost our moods etc could just be the key to having a great day, week or life! Anjie, Thank you so much for this interview! I love that you mix green design, spirituality and beauty, what was the reason for this? I have a holistic approach to everything in life. I’ve found that, when things begin to interconnect, I’ve truly found something meaningful, and when your design is inspired by spirituality and meaning, we find true beauty. It’s easy to make something look pretty—more challenging to create something that resonates and supports you. Ooo, that’s a great thought! What do you think all three (green design, spirituality, beauty) have in common? They all seek to create harmony. Green design looks to connect our individual lives to the environment as a whole. Spirituality shows us there’s more than what we can visually see. Beauty makes us smile and cry, and inspires connection. Harmony. I agree. Ok, (apologies if i sound like an ignorant twart!) is it just woo­woo or does Feng Shui really have an affect to our lives? Feng Shui is definitely “woo­woo” but also affects our lives! Much like many things in my life, I followed what the universe presented, and it led me to Feng Shui. Before that, I was like most people, “What is this woo­woo stuff?! ?” But I’ve incorporated Feng Shui philosophy into my life and never looked back. I have created a unique career for myself, study all the things that I love, and help others along the way. I am where I am now, because of Feng Shui. How can I (on a low budget, financially­-struggling-­not­-complaining-­though blogger doesn’t earn much :p) change or improve the environment of my space? For more Focus: I have a focus spray on my website that’s my favorite to use at my office when I need extra support. This formula no.2 FOCUS is a blend of rosemary, cedarwood, frankincense and other essential oils with carnelian crystals for clarity, precision and direction. In this day and age, we could probably all use a little more focus, and especially as a blogger, the Focus spray can help you create more centered, meaningful and effective posts. You can also use a 3” round mirror fastened to the ceiling right above your head when you sit to channel and focus your qi. The mirrored side faces down. For more Abundance: I carry a piece of tumbled citrine in my wallet. The Abundance area of the Feng Shui bagua map is related to wealth, prosperity, and self ­worth. Citrine is particularly effective at generating and attracting the same things! This natural crystal supports abundance especially well when placed in the corresponding area of the feng shui bagua map in the bedroom, desk, home or office. Citrine is invigorating and promotes joy too. You can also carry the stone with you, in your wallet, to attract more wealth. Set of 3: Make it triple effective by placing one stone in each of the abundance areas of your bedroom, your desk and inside your wallet/pocket. For more Love: If you’re lonely and looking for companionship, activate the Relationship area of your bedroom. The bedroom represents you and also your future partner. One powerful adjustment (and one of the easiest) is to place two pieces of rose quartz in the Relationship area, the back right corner, of your bedroom. Rose quartz heals the heart chakra, which encourages emotional healing, so even if you’re already in a relationship, they can promote trust and harmony. You might also consider placing the rose quartz in the opposite area, the self­ Knowledge and cultivation area (that’s the back left). When placed here, rose quartz can help learn to love and appreciate yourself, and we’ve all heard that’s the first step to attracting real love! Thank you so much Anjie for the first part of the interview. Look out for Part 2 of the interview with Anjie Cho. In the meantime, I’m sure you can learn a lot more from her at www.anjiecho.com and www.holisticspaces.com or her very own podcast channel. While at it, don’t forget to check out MOTM Wellness Podcast too! I resonated so much to her book, her site and the things she does. It’s like I’m a stalker or girl­fan from Asia that can’t get enough of the kind of work she does. Like these beautiful mandalas (10% of the proceeds from each Holistic Spaces Mandala will be donated to support Tibetan refugee children at Bon Shen Ling’s Menri Monastery in Dolanji, India), aromatherapy mists for your space and items for space clearing like mirrors or sage. That reminds me i need to sage my room this month, it’s my birthday month! I guess it is only apt that I share this interview with you after my podcast on Spaces (While at it, subscribe please!). I mean regardless of what you believe in, i guess it is a common understanding (i may be wrong) to always do space clearing when you first step into your new home. I remember when we moved to our new home, I see my dad recite prayers in all corners of the home so as to ward of evil etc. Eventually we all want to guard our space and create space that allows us to feel at home, feel intune with ourselves and enjoy experiencing that area day in and day out.